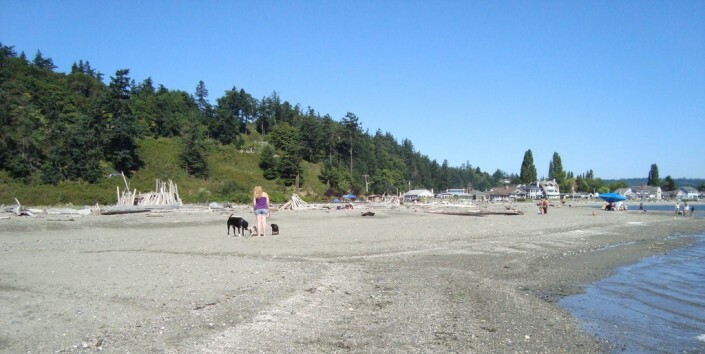 Click Here for Whidbey Island Public Beach Access Maps. 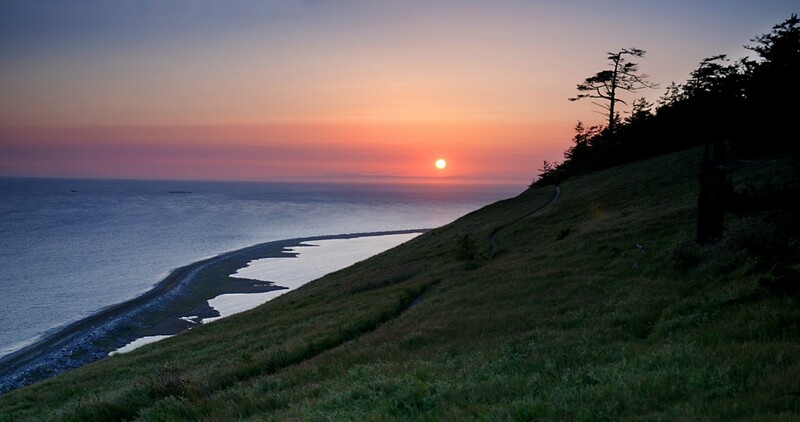 The Reserve at Ebey’s Landing provides a vivid historical record of Pacific Northwest history, including the first exploration of Puget Sound by Captain George Vancouver in 1792; early settlement by Colonel Isaac Ebey; growth and settlement resulting from the Oregon Trail and the Westward migration; the Donation Land Laws (1850–1855); and the continued growth and settlement of the town of Coupeville. The beach at Ebey’s landing is one of the Crown Jewels of Whidbey Island. 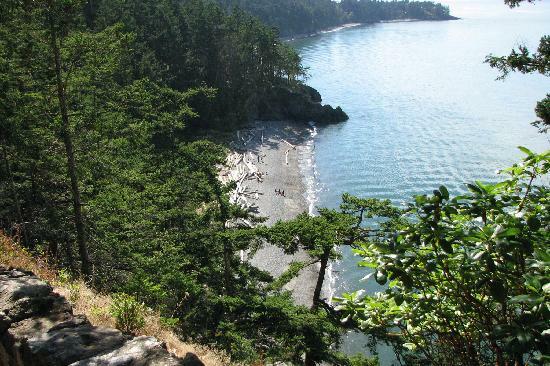 Stretching for several miles, your options for enjoying this rocky, windy lookout over the Strait of Juan de Fuca are endless. You can walk along the beach itself, which is a popular Salmon fishing location during Fishing season, or follow the cliff side trail, leading you up along the bluffs on the north end of the beach. If you want the total experience, you can hike the loop trail in either direction, following it along the beach and the bluffs for over 5 miles. 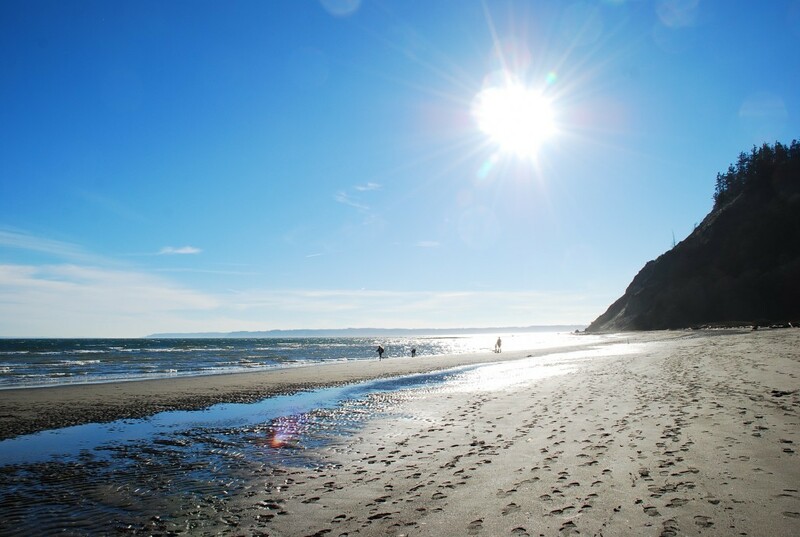 Double Bluff Beach is considered by many to be the best beach on the Southern end of the island, with its offering of shellfish harvest and at times, or with a little walk, total solitude. This beach is the sandiest on Whidbey, reminiscent of the sandy beaches you would expect to find in areas like Southern California. The beach tidelands themselves comprise Double Bluff State Park. The Southern end of the shore faces South, toward Useless Bay and, further to the South, towards Puget Sound and Seattle. 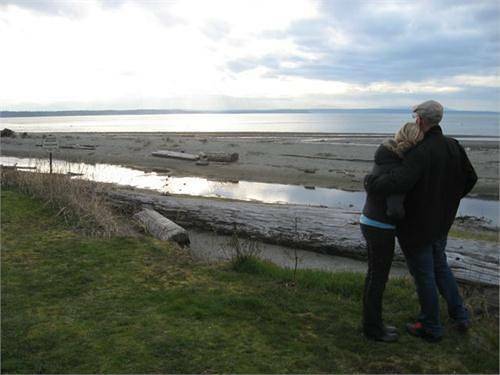 On clear days, Mt Rainier can be seen on the horizon. Fed by sand from the bluffs at its East and West ends, Useless Bay has a sandy, shallow slope, making it impossible for boats to approach the shore. 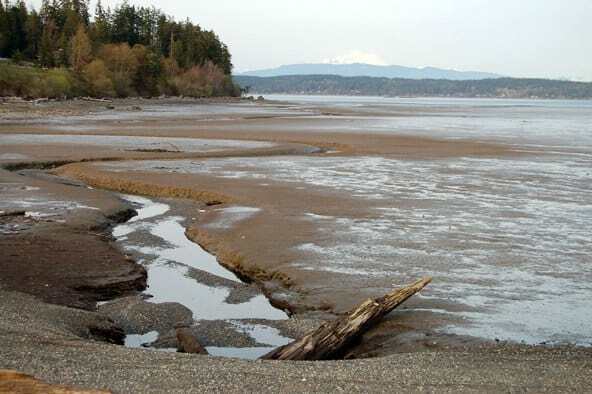 This geographic feature is what gave Useless Bay it’s name. 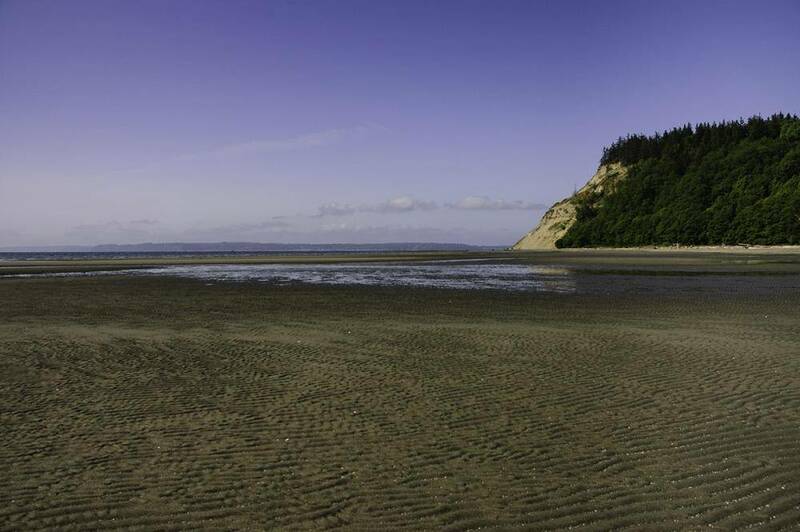 During low tide, the beach can extend more than a half mile out from the shore. 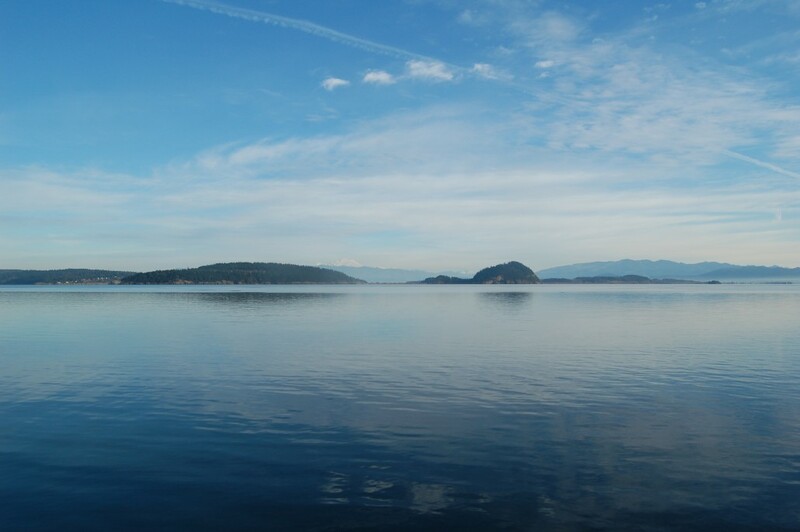 Useless Bay opens to the West into Admiralty Inlet. 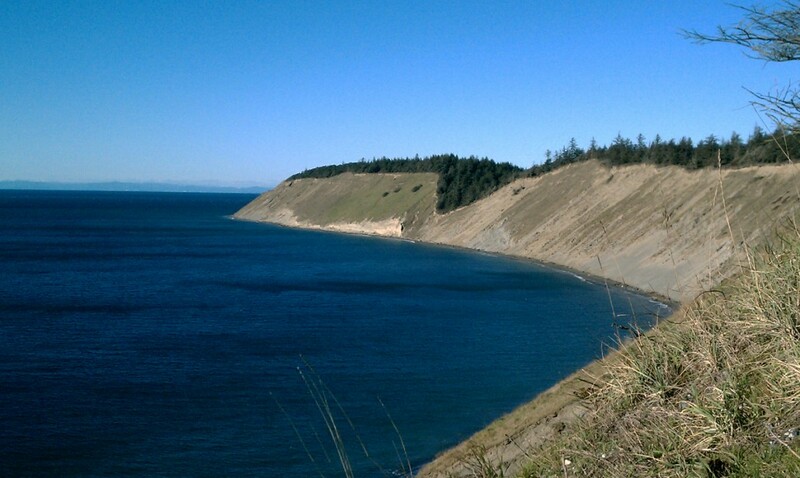 The shore here abuts a large bluff which rises from Useless Bay and descends to Double Bluff several miles down the shore. 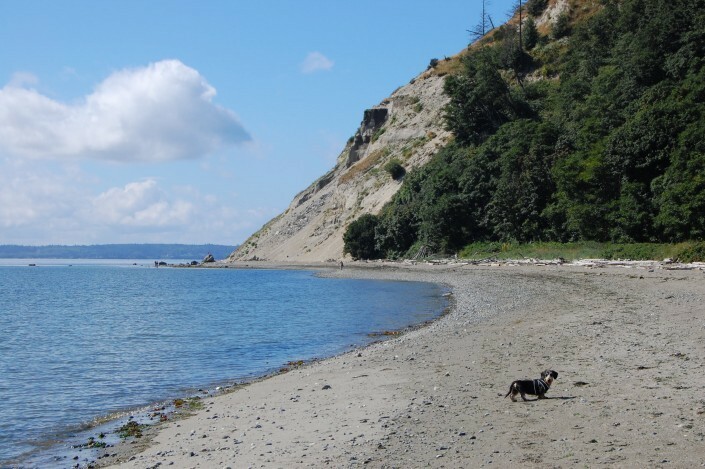 Double bluff is also unique in that is the only off-leash, dog-friendly beach in the area. This is not your typical beach. It doesn’t bring to mind iconic white sand beaches, with waves breaking across the shore. This is not a place that many tourists find, in fact you can find complete solitude here most days. There are several small public access points along Dugualla Bay. They’re small, with parking for only a handful of cars. These spots are where locals stop, usually to be alone with nature for a while. Ducks, eagles, cormorants…it’s a great place to watch birds while you listen to the chirping of an uncountable number of frogs. 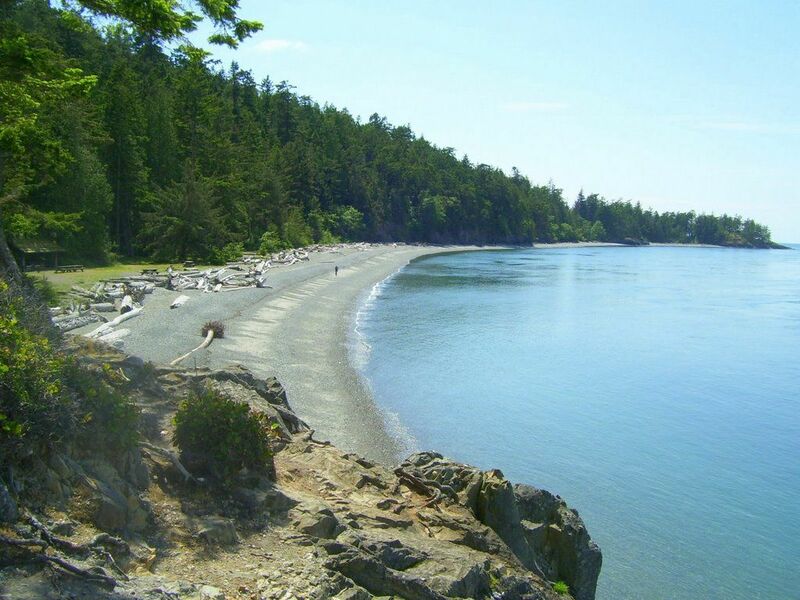 If you’re looking for solitude coupled with a bautiful view, and the close embrace of Whidbey Island Flora and Fauna, this is the beach for you. 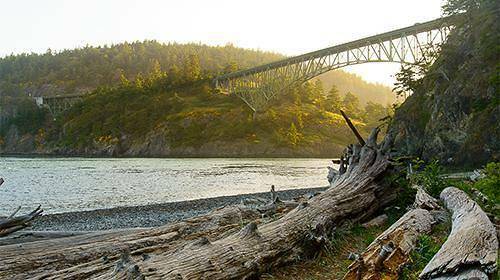 The majestic Deception Pass Bridge spans the rocks above you. On some days it will slide through the fog and on others shine in the late morning light. As the tide flows, you can watch the water flow through the pass like a river, the phenomenon that gave rise for boaters to name the stretch of water: Deception Pass. 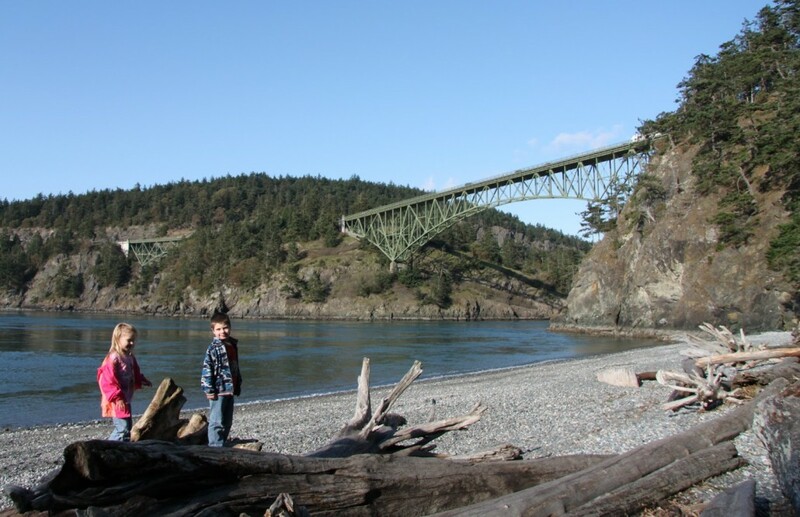 If you want, you can hike up to the bridge, and walk across it to watch the water flow beneath, or you can simply enjoy this beach, fish for Salmon off the shore or enjoy the Deception Pass State Park of which it is a part. 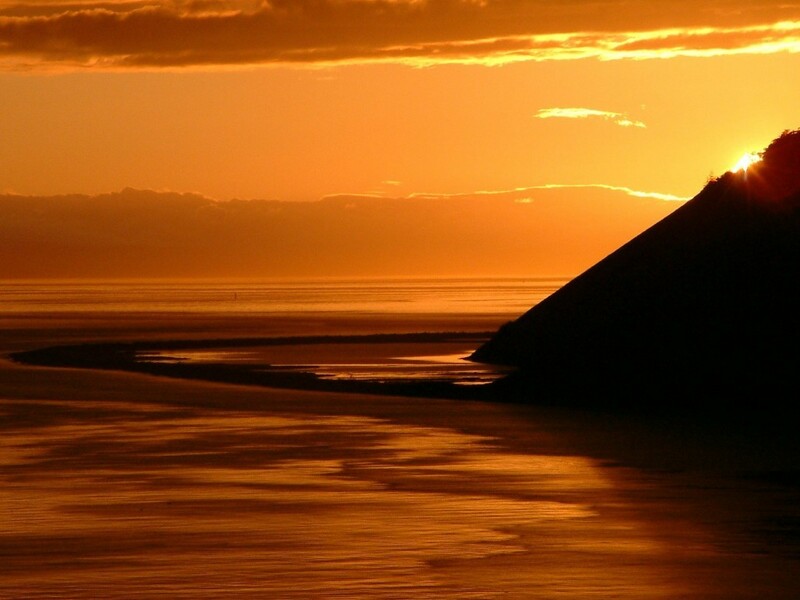 The beach is only a short walk from easy parking, but be warned it is quite popular with tourists, especially during the Summer months. So, if you’re looking for seclusion, this is not the beach for you. 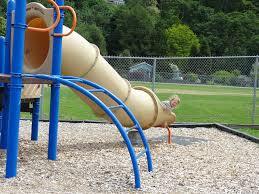 Not many people visit Dave Mackie Park most of year. 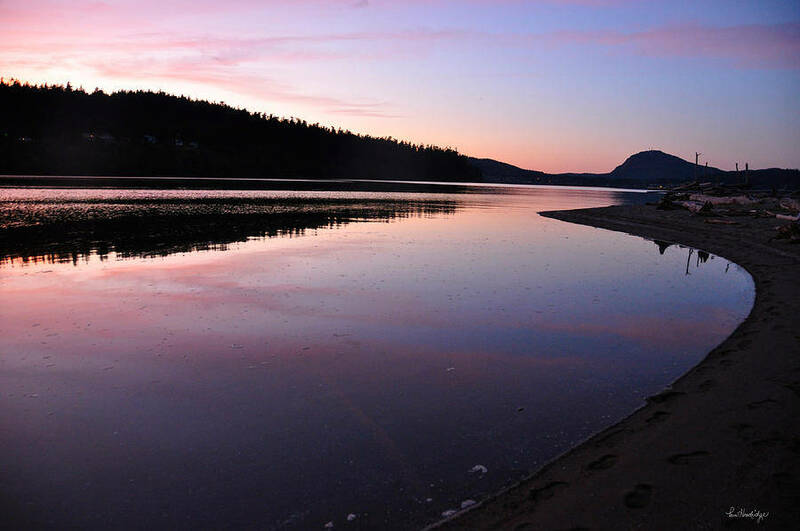 During the summer months, the nearby vacation homes fill up, and you’ll see visiting children fill up the nearby ball field and playground, but overall this huge, westward facing public beach is fairly underutilized. 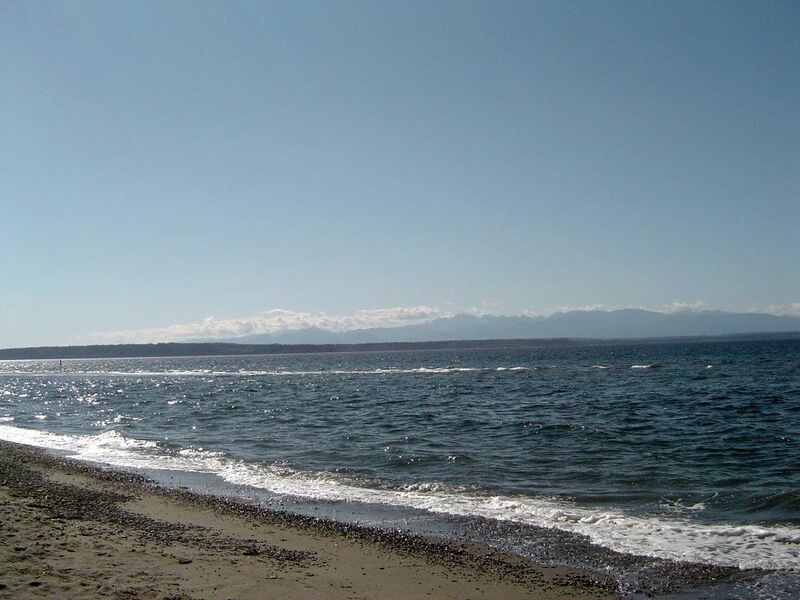 That makes it great if you are looking to have a lot of space to yourself on a nice sandy, breezy beach on South Whidbey. 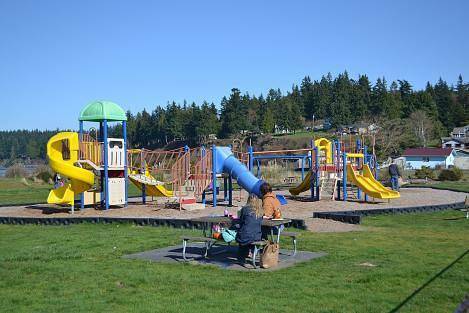 This is a great place to view the Olympic Mountains on a clear day. Every 4th of July, this park is host to the celebrated Maxwelton Independance Day Parade, a local tradition that relies on the support of locals to make it a success every year. 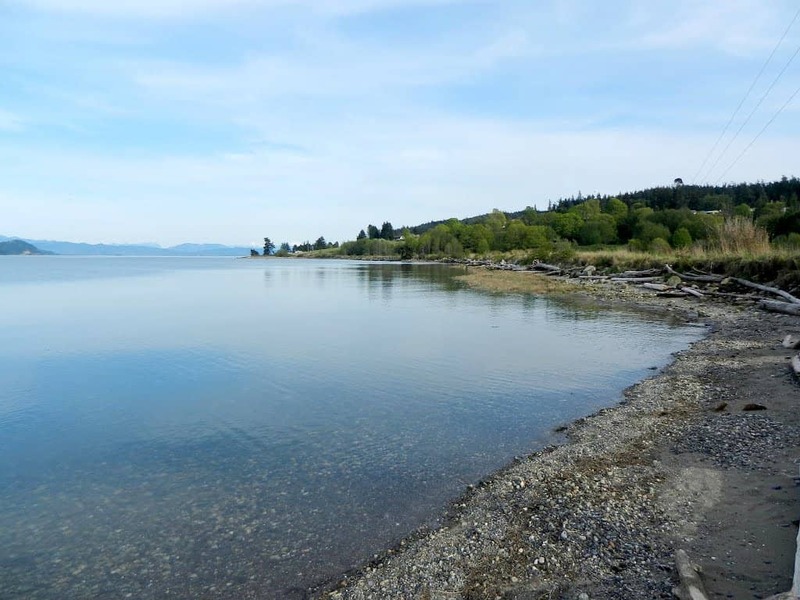 Owned by the Port of South Whidbey, this beach has made great progress over the years in being a good location for a local beachgoer, and the Port continues this work even as I write this. Feel free to contribute and add your voice tom the conversation.